Russell Fraser Sales introduces a new second generation handheld XRF analyser from Bruker Elemental designed to deliver both speed and accuracy in analysing the elemental composition of various materials. There is a lot of uncertainty about the quality of imported alloys in today’s market; it is therefore vital to assess the standard of materials being imported and also ensure fabrication items are checked against alloy mixes. The new S1 TITAN handheld XRF analysers from Bruker Elemental quickly and accurately analyse elemental composition and identify the alloys in the given sample. 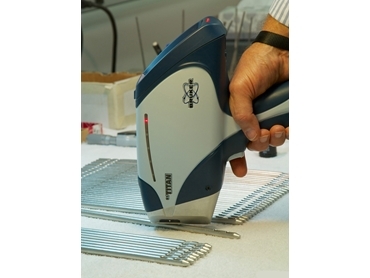 Capable of analysing a vast list of materials, the S1 TITAN XRF analyser can be configured specifically to analyse precious metals and has possible applications in aerospace, automotive, metals processing, refineries, power plants, mining, recycling, scrap sorting and consumer product testing. Key features of the new S1 TITAN XRF analysers include a weatherproof, IP54-rated housing; optional integrated camera and/or small spot collimator; protective TITAN Detector Shield standard on all models; and enhanced Sharp Beam technology for improved precision measurement and reduced power requirements, increasing battery life. The new S1 TITAN is available in four configurations: S1 TITAN 800 and 600 models use a thin film window and FAST SDD detector for fast analysis of up to 37 elements, including light elements. S1 TITAN 200 and 300 models are good value analysers with SiPIN detectors. When equipped with an aluminised Kapton window, the S1 TITAN can measure in-process samples at temperatures up to 500°C.